News out of New York yesterday revealed that the long-running (three years to be exact) battle between Gucci and Guess over trademark infringement has come to a close. Judge Scheindlin ruled in favour of Gucci and asked Guess to pay $4.7 million in damages. While the lengthy saga may be over for now, two really interesting things have popped up as a result of the ruling. The first is that Gucci were awarded only $4.7 million of the $221 million they had asked for and two, the ramifications of this court case on the future of fashion. The offending design in question. 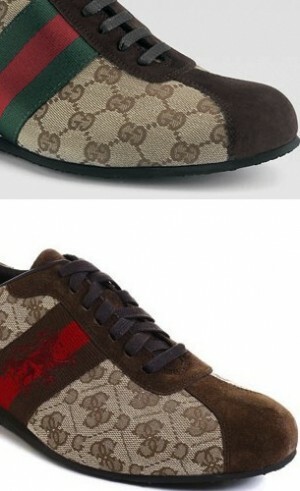 Top is Gucci and bottom is Guess. Well the first is interesting, because even though the Judge sided with Gucci, $4.7 million for such a gross trademark infringement is very low. So more than likely, what the Judge ruled for is that trademark dilution occurred here, as opposed to outright trademark infringement. This is interesting as it could mean more and more lawsuits of this kind will start appearing before the courts, but the sums will be much reduced than what would originally have been expected. By this model only outright copying or counterfeiting will be prosecuted under trademark infringement. The second interesting thing to come out of this, is the ramifications on the fashion industry. As a result of this lawsuit it’s quite possible that there will be stricter controls on patterns, stitch designs and specific fabrics to prevent a repeat occurrence of this type of lawsuit. That means it’s going to be a lot harder to be influenced by other designers, and in my opinion stifles creative freedom. Let’s hope it doesn’t happen. But as one fashion scandal ends in the courts, others I’m sure will arise pretty soon. In the meantime, have a look at what Judge Scheindlin said about fashion. It’ll make you giggle or snort, depending on your sense of humour. Over the past three years, the parties have put in countless hours and spent untold sums of money, all in the service of fashion — what Oscar Wilde aptly called ‘a form of ugliness so intolerable that we have to alter it every six months.’ With the instant [i.e., immediate] disputes now resolved, and with Gucci’s entitlement to the relief noted above, it is my hope that this ugliness will be limited to the runway and shopping floor, rather than spilling over into the courts. Interesting news. Never liked Guess, as I always thought they were very tacky. Hello, i saw you visited my site thus i came to “return the favor”.I’m attempting to find things to enhance my web site!I suppose its ok to use some of your ideas, if you dont mind!! My brother suggested I might like this website. He was entirely right. This post truly made my day.